I eat a LOT of oats. They’re cheap, filling, nutritious, and can be prepared a variety of ways. What’s not to love? Sure, a lot of people have not-so-fond memories of gluey, tasteless oats that were fed to them as a child, but I’m here to tell you that not all oats are created equal! Depending on what type of oats you buy and how you prepare them, oats can take on several different flavors and textures. So, which type is best to use? That’s up to you. 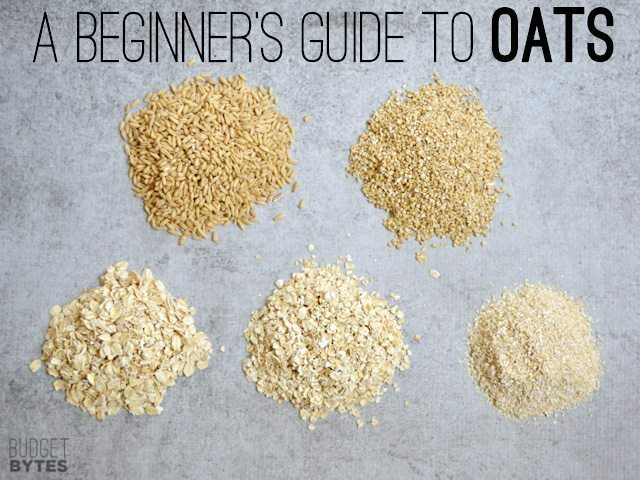 I’ve prepared a guide below to help you differentiate between some of the more common oat varieties, how to cook them, and how they can be used. Enjoy! I took a quick trip to Whole Foods today and picked up several types of oats: whole oat groats, steel cut oats, rolled oats, quick oats, and oat bran (from top left to bottom right). Buying your oats from bulk bins is usually far less expensive than buying packages or canisters of oats (my local grocer had a large container of rolled oats priced at over $5! Eek, too high!!). Buying oats in bulk and storing in reusable containers uses less packaging and you can even purchase reusable (and washable) bulk food bags to use instead of the plastic bags provided by the store. Description: Groats are the whole oat berry (just like a grain of rice, barley, or wheat berry) that has had the tough hull removed. The bran and germ are intact, making this type of oat very high in fiber and nutrients. Cooking: Because these oats are whole and protected by the bran, they take the longest of all the varieties to cook. Soaking the groats for at least one hour or over night before cooking is recommended. Once added to boiling water, soaked groats will need 45 minutes to one hour to fully cook. Stove top cooking instructions can be found here. Groats can also be cooked in a slow cooker, rice cooker, or dutch oven. Oat to Water Ratio: 1 part oats to four parts water (1:3 ratio for a less creamy and more rice like finish). 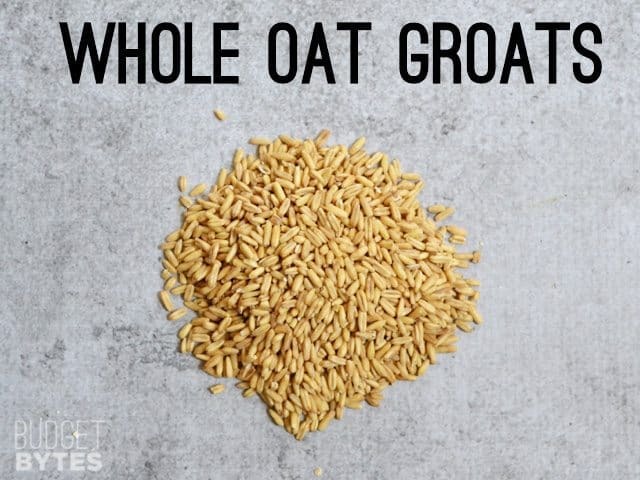 Uses: Groats can be eaten for breakfast like other oat varieties, but their rice-like texture also makes them great for pilafs and salads, similar to how wheat berries or barley is used. Groats can also be ground at home, providing you have a grain mill, into steel cut or whole grain oat flour. 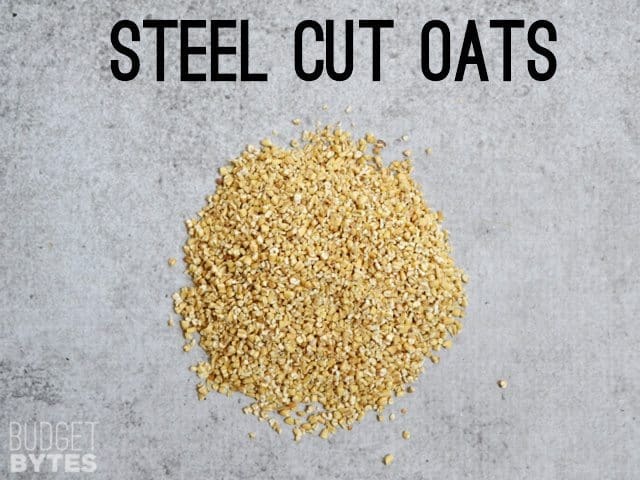 Description: Steel cut oats are essentially whole oat groats that have been chopped into pieces (but not rolled). This type also contains all of the bran and germ and is also high in fiber and nutrients. Because the starchy center of the oat berry is exposed, they cook slightly faster than groats and create a creamier texture. Steel cut oats come in a variety of sizes, some more finely ground than others. Steel cut oats are also known as Irish oats or Scottish oats, with Scottish oats being ground a bit finer. Cooking: Steel cut oats do not need soaking, but still require about 20-30 minutes of simmering on a stove top to fully soften. Cooking steel cut oats in slow cookers or rice cookers is a convenient way to take the effort out of the process. Make your steel cut oats in large batches and reheat individual portions throughout the week for a quick breakfast. Oat to Water Ratio: 1 part oats to 4 parts water (1:3 for a thicker, less creamy finish). Uses: Steel cut oats are most commonly eaten for breakfast, although savory preparations make a great alternative to polenta or other grain porridges. Why I Love Them: They have a much nuttier flavor than rolled or quick oats and tend to keep me full longer. The chewy texture of the oat bits are fun to eat and remind me of tapioca. Description: Rolled oats are whole oats that have been steamed, rolled flat into flakes, then dehydrated. The steaming process partially cooks the oat, so the final cooking process is much faster (think regular rice versus instant rice). 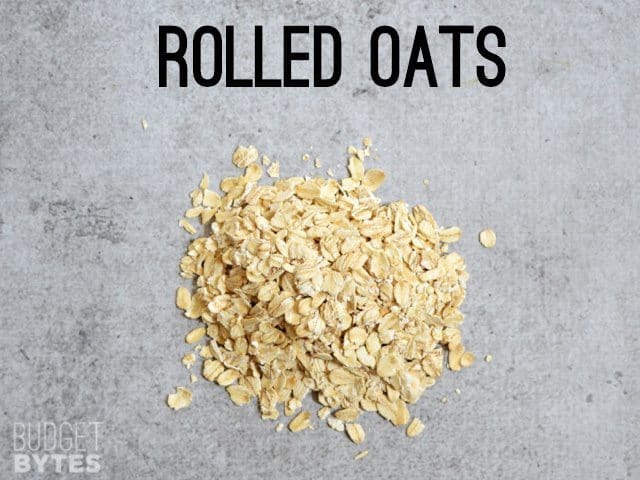 Rolled oats still retain a lot of the bran and are fairly high in fiber. Exposure to steam and oxygen during processing causes many of the delicate nutrients to be lost. Rolled oats are also called “old-fashioned” rolled oats and may come in a variety of sizes and textures, but in general the rolled flake is left whole. 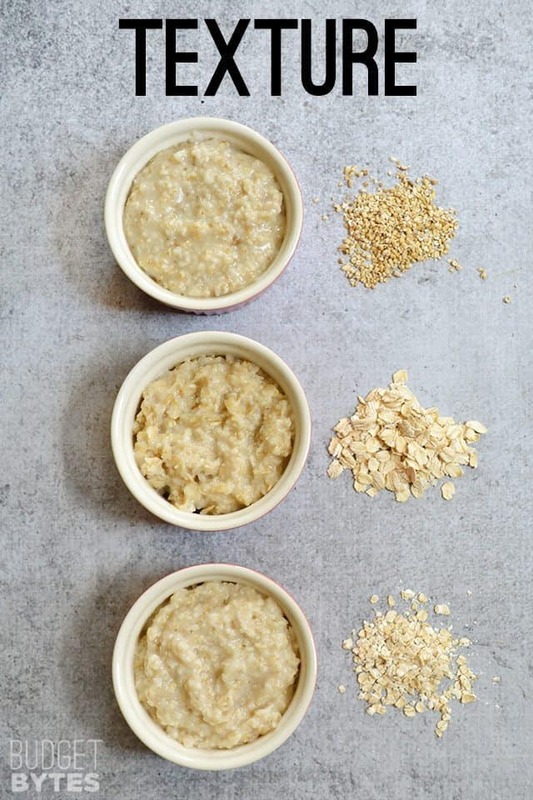 Cooking: Rolled oats cook extremely fast compared to steel cut, requiring only about 3 minutes in the microwave or 5-10 minutes of simmering on the stove top. The highly exposed starch makes a soft creamy texture once cooked. Oat to Water Ratio: 1 part oats to 2 parts water. Uses: In addition to the obvious hot breakfast porridge, rolled oats can be incorporated into breads and other baked goods for added texture. They make a great decorative topping for muffins and bread, and can even be baked into breakfast oat casseroles. Why I Love Them: This is my favorite type of oat because they’re fast to cook but still provide a lot of texture. I love the juxtaposition of the chewy flakes and creamy oat starch. Description: Similar to rolled oats, quick oats are steamed and rolled into flakes, but are then chopped into small pieces before dehydrating. The longer steaming process and smaller pieces allows these oats to cook extremely fast. The more extensive processing also means less fiber and nutrients are retained. Instant oats, which are a type of quick oats, are processed even further and only require the addition of hot water to rehydrate. Cooking: Quick oats only take about one minute in the microwave or a few minutes on the stove top to rehydrate. They create an extremely creamy oatmeal, that can sometimes be interpreted as gluey. To prevent the gluey texture, make sure to add enough liquid before cooking. Too little liquid and the oats will be stiff and sticky. Adding more liquid will loosen them up and create a nice creamy oatmeal. Uses: Like rolled oats, quick oats can also be added to breads and baked goods although they’ll be less noticeable in the end product. Quick oats are also great for use in skin treatments because the soothing starch is very exposed and reconstitutes easily with water. Why I Love Them: They’re the creamiest! I usually love rolled oats the best, but there is an undeniable deliciousness about the super creamy quick oat. Plus, they’re fast. Who doesn’t love that? Description: Oat bran is the fibrous outer coating on the oat berry (think of the thin papery coating on peanut). This stuff is straight up fiber and is a byproduct of the oatmeal making process. Luckily, some of us want the oat bran, so it’s packaged and sold rather than discarded. Cooking: Oat bran is most often used as an additive or supplement to other foods, but can also be mixed with hot water to create a porridge similar to Cream of Wheat. 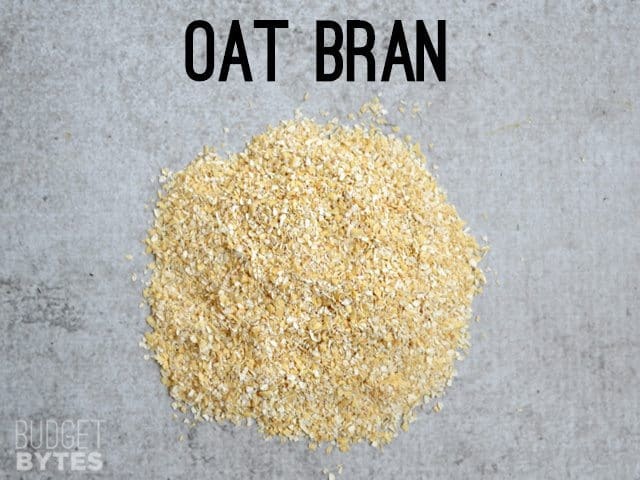 Uses: Oat bran is used to add fiber and texture to other food. It’s what makes oat bran muffins so deliciously nutty. You can add extra oat bran to your regular oatmeal, other breakfast cereals, yogurt pilafs, breads, and other baked goods. It has a slightly nutty flavor. Why I Love It: It’s cheap and instantly increases my daily fiber intake. Win-win. Since I had all these oats on hand, I decided to cook a few of them up so that you can see the difference in the texture once cooked (from top to bottom: steel cut, rolled, quick). Like I mentioned before, the steel cut oats make these really nice chewy little pieces that remind me of tapioca. Super fun to eat and quite filling. The rolled oats are kind of flakey, but still have a lot of creaminess about them – they are my favorite! The quick oats are just all around creamy, not much texture aside from that. 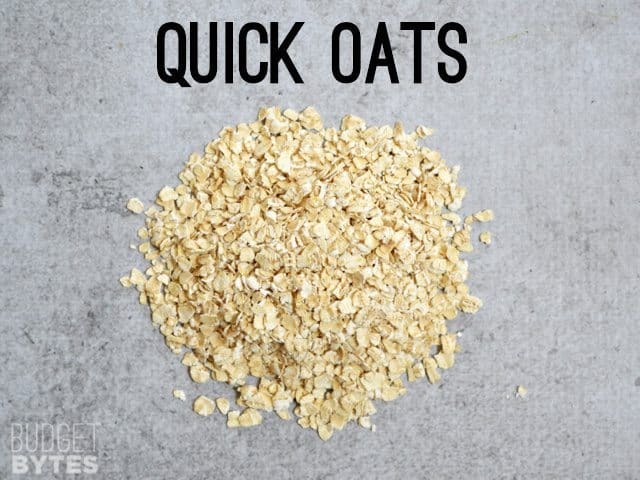 Again, quick oats can get gluey if you don’t use enough water, so make sure to use a 1:2 ratio of oats to water. If they still end up getting dry or stiff, you can stir a little extra hot water or milk in to loosen them up. So, let’s hear from you! Share your favorite type of oats and favorite way to eat them in the comments section below. I eat rolled oats after soaking overnight in the fridge in almond or flax milk with dried/dehydrated fruit. I add nuts and whole fruit in the morning, whatever I have in my fruit bowl and any seasonings that may pair well, like cinnamon. I also use coconut nectar as a sweetener. Adding it the evening before with the milk really saturates to oats. I even added a chocolate protein shake one morning when the oats were a bit dry and I was going to kickboxing. The mix ins are limitless! This may sound strange, but I love cooking oats (any variety) in chicken broth with a little butter. Normally I get strange looks when I say this because oats are normally prepared with some kind of sweetener, but this method is extremely satisfying and comforting. Kind of like chicken noodle soup in a way. I used to only eat steel cut oats, but living on a grad student’s budget has changed all that. Now I buy store brand rolled oats b/c they’re a lot cheaper than the steel cut that are available locally. I’ve really been enjoying them with a chopped banana, some unsweetened coconut, and a bit of brown sugar. Also, I’m a huge fan of barley. I used it in my take on your Mujaddara, and it makes an even better version of rice pudding because it’s sweeter. Ironically, the cheapest place to get it in the town where I attend school is the little natural foods store that’s normally twice as pricey. A full dollar less per pound! Loving oat bran lately. Cook it with water for a few minutes, add a splash of milk, candied pecans or walnuts, and either banana, frozen or fresh berries. Rotate with steel cut every so often. Only kind of oat I don’t like is the mushy instant, or any overcooked gluey mess- I like it loose and almost watery! I’ve been obsessed with it since writing this post, too. I just LOVE the texture and it’s higher in protein and fiber than regular oats, so it’s like a win-win-win! I eat steel cut with flax seed meal for breakfast every morning. I cook it at work, where I only have a microwave. It took me a long time to find the right recipe and cooking time and temp, but here’s what works for me. Microwave for 20 minutes on 40% power. It won’t boil over at that setting. I also mash up a spotty overripe banana with a dash of whole milk and stir that into the finished oatmeal. I eat that at 8 am and I don’t need lunch until 2 pm. Super weird, but I love rolled oats in cold almond milk and a bit of sugar. I like that it has a slight crunch instead of being creamy. I’m a big fan of the “old-fashioned” rolled oats. I sometimes eat quick oats too (because they’re so quick, which is handy for the mornings before work) but don’t particularly like the texture.